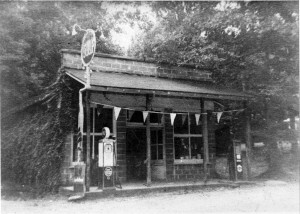 In the heart of the Dunn’s Rock/Connestee Community where Island Ford Road meets the Greenville Highway stands the small complex of buildings known for many years as “Powell’s Store.” Powell’s Store was a general store with dry goods, food, gasoline and the most basics. Folks could buy overalls, shoes, groceries, coal oil, soda pop and the most delicious candy delivered by Pisgah Candy Company and displayed front and center when you entered the double front door. The school bus picked up and dropped off kids who found shelter there. The Transylvania County Bookmobile’s twice-weekly visits were festive occasions for picking up reading materials and for visiting. Dr. Hill, the veterinarian, made his vaccination visits there for community pets. The local mail man and the Greenville mail truck driver, as well as locals, tourists and loggers, made their morning breaks there, further occasion for news in this pre-television era. During the summer, an occasional camper from Rockbrook Camp next door would sneak by for a candy bar or a touch with the outside world. With the demise of Mr. Powell the store was closed for a while and then was re-opened by Albert Reece who operated it for many years as a grocery store. By that time, the demographics had changed and people drove into town to chain stores or big grocery stores for shopping. But if you wanted to stop for a cool soda pop, or a loaf of bread and slow down and visit, the store provided that place. Albert retired and Janet (Compton) Robertson opened The Farm Country Store to sell fresh produce from the farm she and her husband Dale ran. Other local items were sold and the old sense of a gathering place was recaptured. After Janet’s popular, but brief, stay Ardria W. Hofmann, who owned the property, suffered failing health and the property was purchased by the Dodson Family for a home for Mud Dabber’s Pottey. John and Sybil Dodson ran the first Mud Dabber’s at the Old Distillery building just up the road for some years while John also taught pottery for Rockbrook Camp, the office of which is also housed in the Old Distillery. Now with the new location for Mud Dabbers in a renovated Powell’s Store complex, another Dodson son, also named John, and his wife Carol, set up an expanded space for all forms of clay works. Over many months, the Dodsons worked to preserve the old buildings and their original character. The main, central store is now the Mud Dabber’s gallery and studio. The Dodsons discovered and renovated one of the original heavy oak sales counters and use it for the center work/sales desk. The old half glass double entrance doors did not meet modern building codes so they preserved them by making them into a singlewide door. The original floor was sanded and renewed and the old cinder block exterior repainted to a lively color. Neighbors planted flowers around the periphery and aged wood from the Earl Parker lumber shed was used for the inner walls. This respect for the history and the past meaning of the store in the community is at the core of their renewal efforts. Several local potters sell their crafts at Mud Dabber’s. A brief history cited from “This Old House: Dunn’s Rock/Connestee Buildings on Highway 276,”Copyright 2001 G. Keith Parker, Ph.D. Used by permission. All rights reserved.